Border Stamp Slate StoneConcrete Stamp Rigid with handles and Flex without handlesStamp size: 32½" x.. Concrete Stamp Rigid with handles. Brick Border StampStamp size: 30¾" x 8¾" (78cm x 22cm) approximat.. Concrete Stamp Rigid with handles. 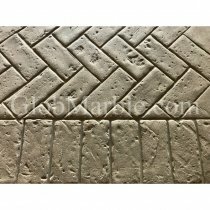 Brick Border StampStamp size: 34" x 8 1/2" x 3/4" (86 cm x 21.50 ..
GlobMarble offers the most attractive and unique wood log texture stamps for stamping concrete.These..
Border Stamp Tumbled Travertine Stone. Concrete Stamp Rigid with handles and Flex without handlesSta..